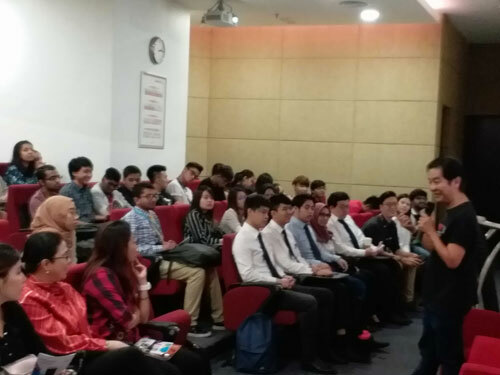 It was an exploration of innovative ideas as Malaysian inventor, innovator and entrepreneur, Robest Yong, met over 100 students from INTI International College Kuala Lumpur (INTI) during INTI’s Business Week. The 1994 Malaysia National Inventor award recipient who hailed from Nibong Tebal in the state of Penang, was invited to be a speaker at the recent INTI Leadership Series (ILS), presenting on the topic of “Innovation, Disruption and Entrepreneurship: Thinking without the Box and What Makes Innovation and Entrepreneurship Happen”. During the talk, the innovative entrepreneur or “innopreneur” shared key events from his 25-years of experience, including his plethora of patented inventions and his secret ingredient to a successful “innopreneurship” journey – the D.U.M.B.S. approach. The D.U.M.B.S. approach entails ensuring a product or service is Doable, Useable, Marketable, Bankable and Sustainable (D.U.M.B.S.). Robest created the D.U.M.B.S. approach as a guide for other aspiring innovators and entrepreneurs to venture into and execute successful ideas. One of the individuals who was responsible for drafting Malaysia’s National Invention Policy in 2011, Robest shared how he adopts this approach with every idea he pursues and encouraged aspiring “innopreneurs” from the audience to do the same. He further added how the most important element off the D.U.M.B.S. approach is ensuring the product or service is Marketable, and he attributed this to the current capitalistic climate. “It is crucial that ideas are invented for commercialization and that they are of marketable value, for it allows inventors and entrepreneurs to secure financial stability and sustain themselves whilst providing for the market’s needs. This becomes a winning solution for everyone.” says Robest. Regarded as one of Malaysia’s most talented “innopreneurs”, Robest additionally shared about his personal upbringing and how it paved his innovative journey. The eighth child of 11 siblings, Robest attributed his innovative spirit to his early days of growing up in a large and financially-challenged family. “Reinventing things has been a passion of mine since I was young. I made things that I needed for myself because it was the cheapest (and most fun) option then. I loved the process of reinventing because I would often improvise on existing products, as opposed to buying things, and in turn create more convenient and efficient products for myself and for others,” says Robest. INTI’s Business Week, an annual event, was organized as a week-long programme to acknowledge the realities and challenges of small and medium-sized enterprises (SMEs) and to introduce students to industry leaders from SMEs as well. The Business Week comprised of diverse events such as the Entrepreneurship Forum, a roundtable discussion for selected students with Robest Yong, and INTI’s Dragon Den Competition which encouraged students to develop new business ideas to be pitched to a panel of judges. In a 2016 Malaysian economic census, it was revealed that SMEs make up 98.5% of Malaysian business establishments and contribute 36.6% to the nation’s GDP . 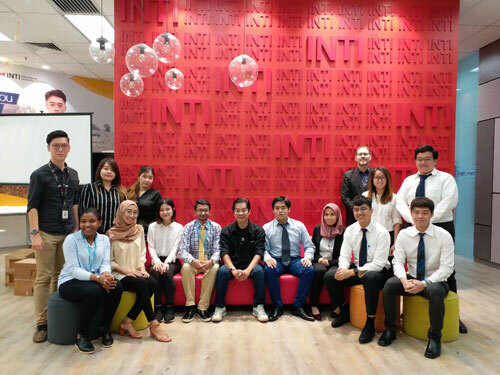 With over 450 industry partners, including established SMEs and entrepreneurs, INTI students have the opportunity to network with these industry leaders and build on their own innovative experience. Programmes such as these are part of INTI’s holistic curriculum which has enabled INTI students to achieve outstanding graduate outcomes, as validated by BDO: including 99% of INTI graduates being employed within 6 months of graduation; 83% of INTI graduates being paid higher than the market average, and 43% of INTI graduates getting job offers even before they graduate.